Museum Gardens Display, York, North Yorkshire. Mobile Zoo at Xscape, Castleford, West Yorkshire. We attend many events throughout the year including Ilkley Carnival, Wakefield Armed forces day, York Roman festival, York balloon fiesta, Brighouse Victorian Christmas market and much more. With over 10 years experience, our head Falconer, Ryan Stocks has delivered exciting birds of prey flying shows in Yorkshire at a number of high-profile events. Whether it has been at the RHS Garden Harlow Carr, the York Balloon Fiesta or Ilkley carnival, Ryan understands how important it is to put on a spectacle. Ryan does this through changing the show every year so that the shows are always fresh and new for spectators who visit the attractions every year. Music, comedy and lots of audience participation mean that the flying shows are always memorable. It is important that the audience is rarely passive at these falconry shows. Ryan uses innovative methods to enrich the birds, whilst at the same entertaining the audience. Volunteers may get to hold one of the owls, or have one of the owls fly close to them. Naturally, this creates lots of laughter and fun. Ryan’s expertise with over 50 different species such as the Harris Hawk, Eagle Owl, Barn Owl, Burrowing Owl, African Vulture, American Vulture and various other breeds, means that he is a source of great knowledge about the birds. Naturally, every bird of prey flying show in Yorkshire that Ryan provides is always safe, fun and full of fascinating facts. 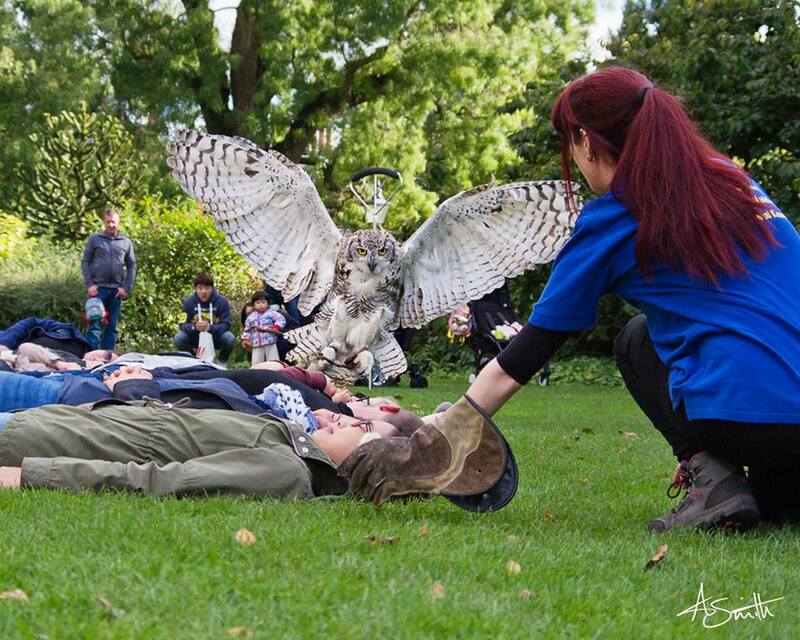 To make your gala, attraction or fair truly memorable, contact us for a discussion about our birds of prey shows in Yorkshire. We can easily access all surrounding counties such as Derbyshire, Lancashire, Lincolnshire and Durham. We can also travel to anywhere within mainland United Kingdom. In addition to the shows, we can also offer static displays that are perfect for country shows, fairs and galas. Over the years we have attended many events including the Brighouse Victorian Christmas market, York Roman Festival and the Armed Forces Day in Wakefield. At these static displays, attendees can get a close up look of the birds as well as interact and hold the birds. Our helpful guides have worked with the falcons and birds for a number of years and can offer interesting insights as to how these amazing creatures fly, forage and subsist. When we attend a fete, gala or event to create a static display, we bring a gazebo with the birds of prey. We have a range of birds at Owl Adventures, but we will always bring a small one, a medium one and a large one, so that children of all ages get to interact with the owls, falcons and eagles. Usually, we will also bring our exotic animal encounters collection to the event, so for any children not attracted or nervous about the birds, they can pick up a snake, spider or lizard instead. Prices shown are for the events within a 60 mile radius of Ripon, North Yorkshire. Additional surcharges may apply for travel costs and discounts are available. Please ask for details. Static Display £120 + "Hold a bird for £2"
Static Display and Flying Show £175 + "Hold a bird for £2"